This shot is looking at the flow from our next door neighbor's yard. The water and debris took down the fence, and pretty much ignored the sand bags and straw wattles we had positioned to divert the flow away from the garage. This shot is looking from our back deck at the flow across our property, with neighboring properties in the background. The two properties in the background were heavily flooded, and the property to our east had flooding across their horse pasture. At one point, we got in our Jeep and drove out to the highway, which was a little dicey at spots. We live on dirt roads unmaintained by the county, and at the end of the road where we turn towards the highway, the runoff coming down from the mountain was very strong. Once on the highway, we discovered all vehicles had been stopped in both directions due to water overflowing from the side ditches. We stayed out there for about 30 minutes waiting for the runoff to subside, then I ended up hiking back to our house while my hubby went back to get the Jeep. Needless to say, I was pretty muddy by the time I got home! No, didn't get pictures of that! But stay tuned... we are in for more of the same for at least the next 45 days, and I'm sure to get more pictures. Sadly, a 12 year old girl from the area lost her life because she went out to see the runoff and fell in and was swept away. I don't think a lot of people were as prepared for the seriousness of this situation as they could have been, and I don't even know if we are as prepared as we should be! I have a 'Go Bag' packed now in case, but don't know where we could go to be safer than we are right here! Our biggest danger is being cut off from the highway if the roads are impassable. We have 4-wheel drive, but it's an older vehicle and I'm not sure it would do too well on really degraded roads. Guess we'll find out! Unfortunately, they have gotten under the house, and I think their mama is dead under there. So I will have to call the local pest control folk to trap and relocate them, and retrieve and dispose of mama. They are the cutest little guys, though! Unfortunately, you can't really see the designs on the white fabric too well... the one on the left has butterflies, the one on the right looks like egyptian hieroglyphics, and the rolled one on the right has sort of lozenge shapes. The square on the upper right makes me want to color with fabric markers or sharpies! I can't wait to play with these, and will post the results when I have some. Did I mention that this little adventure was a 'Shop Hop'? I have no idea if this happens anywhere else, but once a year these shops put this event together, and if you buy a 'Passport' and present it to the clerk when you are making your purchase, you get a discount on your purchase, they stamp your 'passport', give you a charm pack of fabric squares, and you get a chance to win a prize if you visit all the shops. Well, we won't be eligible for the drawing, but we got the discounts and charm packs, and Joyce donated hers to me because she doesn't make anything with such small pieces of fabric, so I have those to play with too! My hubby and I took a tour of the properties uphill from ours, and they got hit bad up there. One home had floodwaters come inside. Our neighbors to the left of this picture had quite a bit of flooding in their yard, but had sandbagged in front of their home, so hopefully didn't suffer any damage inside. One street over apparently got hit really bad, and our neighbors to the north had a lot of water washing over the road, but again had sandbagged well enough to keep the flow out of their yards. This is going to be a really interesting Monsoon season for sure! I think there is enough here for you to see the ombre-effect. If you click on the images, you will see some of the blues have overdyed lighter areas to create some focal points. What I am amazed at is that the original circles were really transformed into different shapes! I was expecting some color layering but thought I would see the outline of the circles a little clearer, and maybe if I had overdyed with lighter dyes I would have. But I love the shapes that I get when I use this method to resist-dye. Now I need to get busy and use some of this fabric! On hindsight, I should have grabbed the video camera, but my first impulse is always the digital for stills. This is about as close as I want to get to anything that resembles a tornado! I still have about 5 left to go along the side of the garage, then maybe I will get some sandbags for the front of the property... we get lots of water flow across the road to our house, which is unpaved and currently full of ruts from the winter snowmelt. If the water flow gets deep, it could run onto the property from the road, but I think the biggest problem has been dealt with. Such a fun summer we are having! Dyed fabric - what next? These two are just pinned to a canvas to see how they look. I have left the edges frayed. I'm not totally sure I like the way the mounted one looks, and may have to consider mounting the others in a different way, but I really love the color and composition! The first one, if rotated 90 degrees to the left, makes me think of the oil spill. The third one definitely reminds me of the fire we just had on our nearby peaks. And I still have the large piece yet to mount... I'll post a picture when I have that done. I am really jazzed with the results! Needless to say, I plan to try this on clothing, and with other colors on both fabric and clothing! What a rush! I tried using beads on the tips as embellishments, but ended up removing them as they did not add to the overall look I was trying to achieve. That's when I decided to outline the comet with metallic thread. I wanted sparkle, but the thread was difficult to manipulate. The other two comets will be outlined with regular embroidery floss, and I will figure out a way to embellish them differently. On the bottom left is one of the "Asteroids" with a center embellishment made of tyvek. I first painted a piece of tyvek with Lumiere paint, then used my iron to heat it, causing the bubbly texture. I will be putting the same center in the other two "Asteroids" when I get further along. If you're wondering what caused me to create this particular design, I can tell you it was total whimsy. I was auditioning some of my hand-dyed fabrics trying to come up with a way to use them... as I moved the pieces around on the design board, I started to "see" something, and by the time I began to work on the piece, it had evolved to "Astral Exhibit". We have an Observatory here in Flagstaff, and that may have also inspired me, along with the fabulous view of the stars we get here on clear nights! We are a low-light community due to the Observatory, so that keeps the skies darker than in the more populated areas. Great place to see the Milky Way and comet showers! Okay, back to work... I'll post more soon! 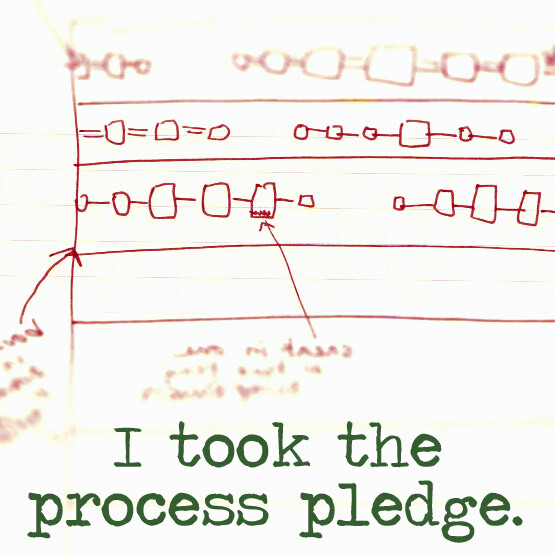 I just took the Process Pledge, which means I am going to try and be more consistent with posting progress reports on my various projects, instead of just posting pictures of the end results. I have a "Slow Cloth" in progress... actually it has had very little attention from me since I started it months ago... but I am ramping up my efforts on it of late, and will take a picture and describe my progress later today. Meanwhile, over on my other blog, www.hippiewear.blogspot.com, I have promised to post video clips of how to create various tie-dye patterns. This works on both clothing and fabrics, so if you are looking for ways to create interesting, colorful one-of-a-kind fabrics, check there from time to time. Stay tuned!